The 2008 Bates College Midsummer Lakeside Concert Series continues with a performance by the world music duo Okbari and special guest Carl Dimow at 6 p.m. Thursday, July 17, in the Florence Keigwin Amphitheater at the college’s Lake Andrews. The 2008 series also presents family entertainers Mary Kaye and Professor Von Wienerschnitzel; the eclectic American folk duo Slattery and Stewart; and the popular Blue Hill Brass Quintet. All Lakeside concerts start at 6 p.m. on consecutive Thursdays in July and August. Sponsored by the Harward Center for Community Partnerships at Bates and the Bingham Betterment Fund, the concerts are open to the public at no cost. Bring a picnic supper and blankets or lawn chairs. The rain site is the Olin Arts Center Concert Hall, 75 Russell St., adjacent to the amphitheater. For more information, call 207-786-6400. Amos Libby and Eric LaPerna are Okbari, dedicated to building upon the revelatory work of oud master and Bates alumnus Alan Gardner. 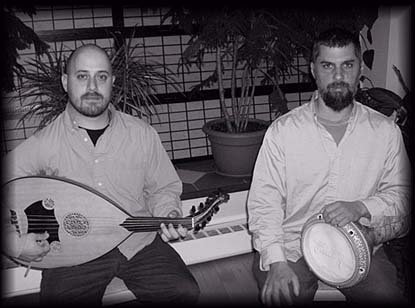 The pair performs Armenian and Anatolian folk music, classical Middle Eastern music, and songs old and new from Greek, Arabic and Balkan traditions. Their own compositions are inspired by the music of the Middle East and India. Their instruments come from around the world including the oud, clarinet, duduk, bouzouki, doumbek, tabla and mridangam. Formed in 1995, Okbari performs throughout the Northeast. Libby and LaPerna were associated with the late composer and master of the oud, Bates alumnus Alan Shavarsh Bardezbanian, aka Al Gardner. Libby began his musical training in Brooklyn, N.Y., studying the Indian drums called tabla with the late Ustad Mulazim Hussain. He was later introduced to the oud by Bardezbanian, and studied Middle Eastern musical modes and the Armenian and Turkish folk traditions with him until his death in 2006. LaPerna has been a percussionist since 1987. In 2000 he joined Bardezbanian’s Middle Eastern Ensemble, and with Bardezbanian learned Turkish, Armenian and Greek rhythms. LaPerna is also a member of the ensemble Alhan, and has performed all over the U.S. including at such legendary venues as the Knitting Factory and Fez, both in New York, and the Arabesque Music Series at Club Passim in Cambridge, Mass. Okbari has released four albums, most recently 2007’s Armenian and Anatolian Folk Music. Okbari also appears as a traditional Armenian and Turkish dance quartet featuring former Bardezbanian ensemble violinist Michael Gallant and noted guitarist Michah Blue Smaldone. A guitarist and flutist, Dimow covers the musical waterfront from classical to jazz, klezmer to blues, and from original theater music to traditional folk. He has performed in Europe and Central America, as well as the United States. He also works with the Kolosko Dimow Duo and the Casco Bay Tummlers, a klezmer band that has released three CDs. Dimow has taught guitar at Colby College since 1981 and maintains a private studio in the Portland region. 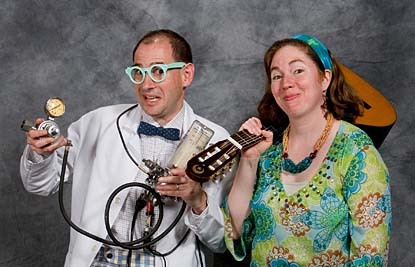 July 24, Mary Kaye and Professor Von Wienerschnitzel: A Maine-based singer-songwriter, Mary Kaye has combined extensive experience in music, theater and education to win critical acclaim as a performer for children. Her work has won national awards including the Listen-Up Award from Publishers Weekly, and has been reviewed in publications including Parenting Magazine, Booklist and the Midwest Book Review. Kaye’s Bates show will feature juggling, magic and other antics by comic cohort Professor Von Wienerschnitzel, played by David Kaye. He teaches acting, directing and playwriting at the University of New Hampshire. His play “Can’t Get There” was aired on PBS and his experimental comedy “And God Said . . .” was a Top 10 pick at the Montreal Fringe Festival. The couple has performed extensively for young audiences. 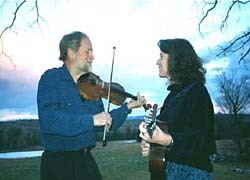 July 31, Slattery and Stewart: Fiddler Andy Stewart and Mary Jo Slattery, a singer and multi-instrumentalist, represent roots traditions including the exuberant soulful two-steps and waltzes of Cajun Louisiana, the upbeat fiddle tunes of French Canada and New England, and the occasional mountain ballad. They have performed all over the eastern United States, as well as Canada and Mexico. Recognized by Louisiana’s Cajun French Music Association for the authenticity of their style and repertoire, these two versatile musicians also play with the Cajun band the Offshore Aces and with the contradance band Northern Spy, included in the Smithsonian Folkways CD on New Hampshire social dancing titled Choose Your Partner! 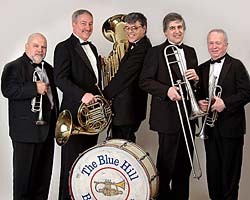 Aug. 7, Blue Hill Brass Quintet: The Blue Hill Brass Quintet has been delighting audiences for more than 20 years. The group has performed throughout New England at such events as the Eastern States Exposition, the Maine Festival, harvest fairs all over Maine and on Maine Public Radio. The players are trumpeters Curt Brossmer and Allen Graffam, hornist Scott Burditt, trombonist Steve Norris and tubist Paul Greenstone. With Brossmer and Burditt serving as principals on their instruments with the Bangor Symphony Orchestra, the quintet’s collective resume also features work with the Portland Symphony Orchestra, the Al Corey Orchestra and the Maine Chamber Ensemble. With a repertoire covering five centuries, the quintet is known both for musical excellence and family-pleasing entertainment.